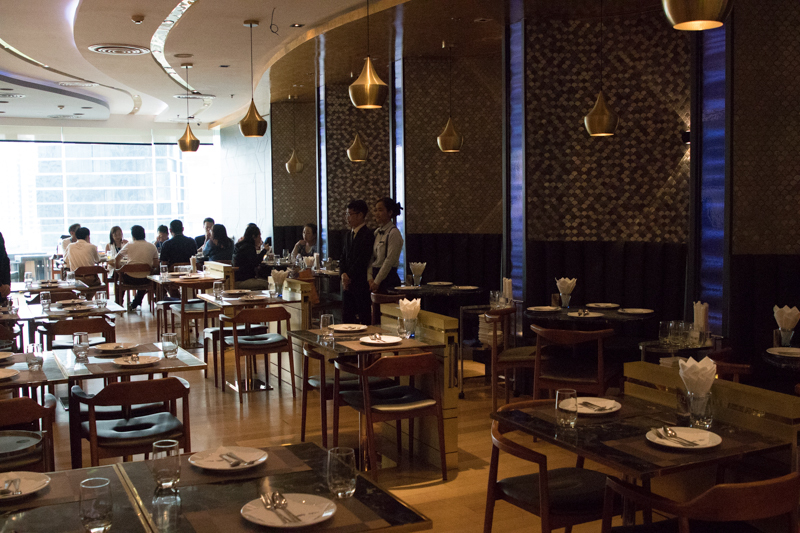 Bangkok has always been known for its delectable seafood and Laem Charoen seems to be pushing the boundaries of that, bringing Thai seafood to a new level. 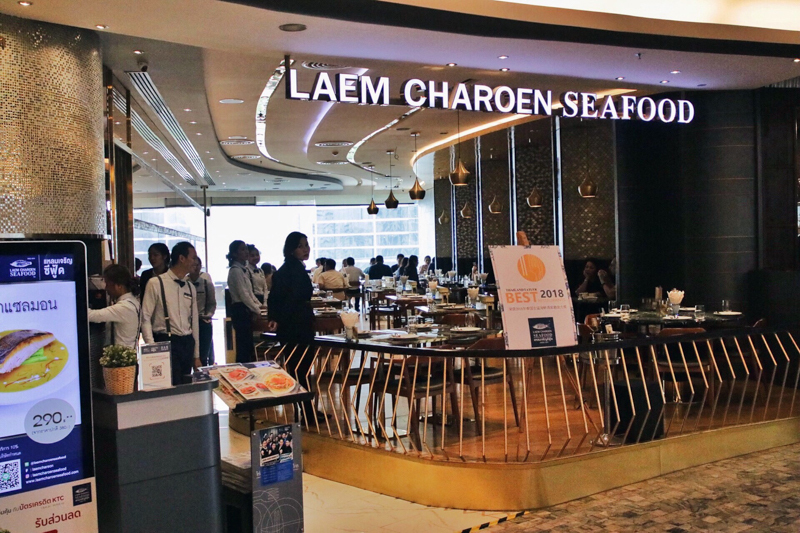 Laem Charoen is a seafood franchise in Bangkok with more than 35 years experience. They specialise in fresh seafood and were the first to introduce the Deep-Fried Sea Bass With Fish Sauce (THB 490++). This famous dish has been popularised ever since and was copied all around the world. So without further ado, I embarked on my journey to this popular Thai restaurant. Their signature Deep-Fried Sea Bass With Fish Sauce was ordered by almost every table and I didn’t want to be missing out. 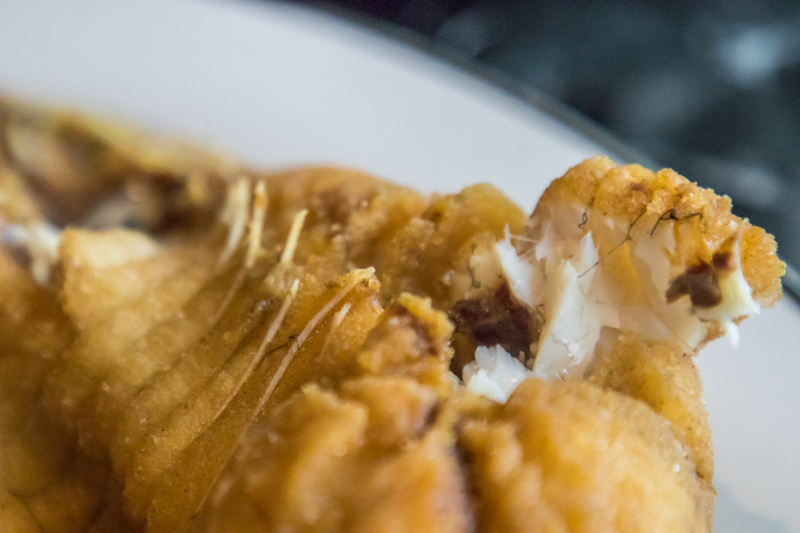 The fish was butterflied before deep-frying which gave the fish an even crispier outer skin. Taking reference from past experiences, I was expecting the flesh to be really dry since it was deep-fried. However, the flesh on the inside was moist and flakey. In addition, the flesh of the fish was naturally sweet which provided a pleasant contrast in flavours to the slightly salty crispy skin. 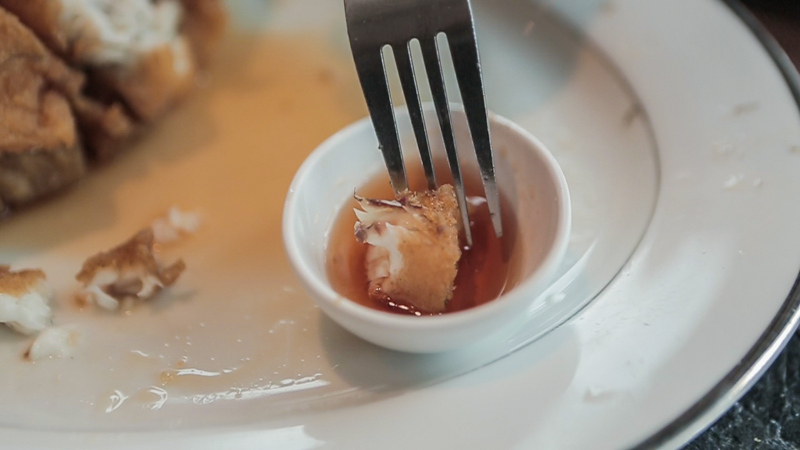 The saltiness from the fish sauce that they provided on the side, helped to further enhance the sweetness of the fish. However, I would recommend that you dip into the fish sauce sparingly as it can get too salty. 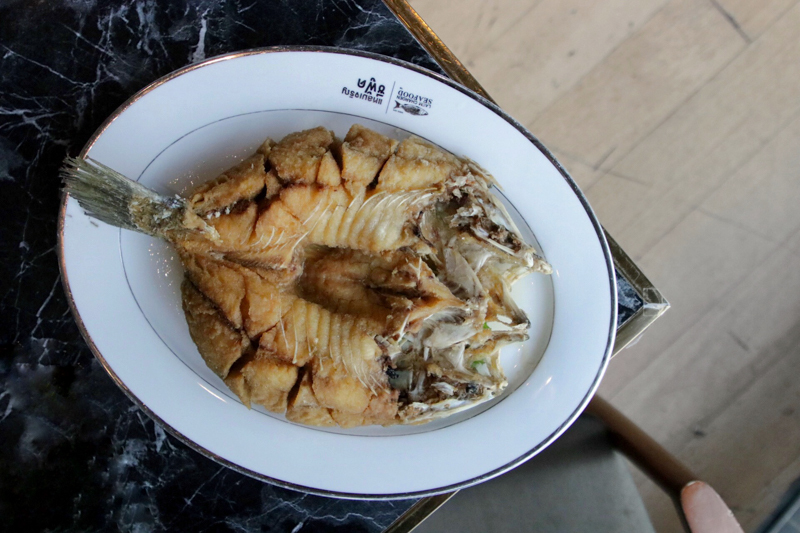 The fish is crispy on the outside and juicy on the inside, it’s no wonder this dish is so famous. This dish would be a must get when you visit Laem Charoen. Next, we ordered the Garlic And White Pepper Fried Soft Shell Crab (THB 295++). 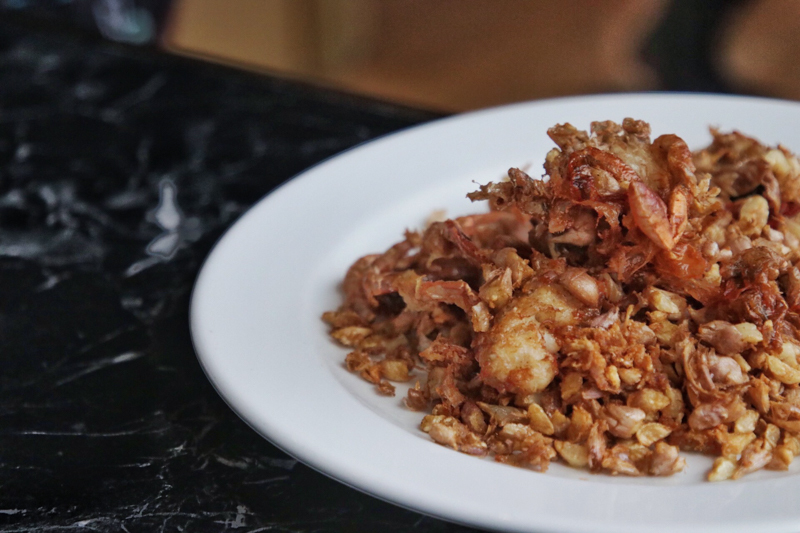 The soft shell crab had an airy batter so that it would not be too thick and oily after deep-frying. The body of the soft shell crab was also extremely succulent with an underlying peppery tone to it. Even if you’re not a fan of garlic, don’t worry because these bits of garlic were not very strong, nor pungent. 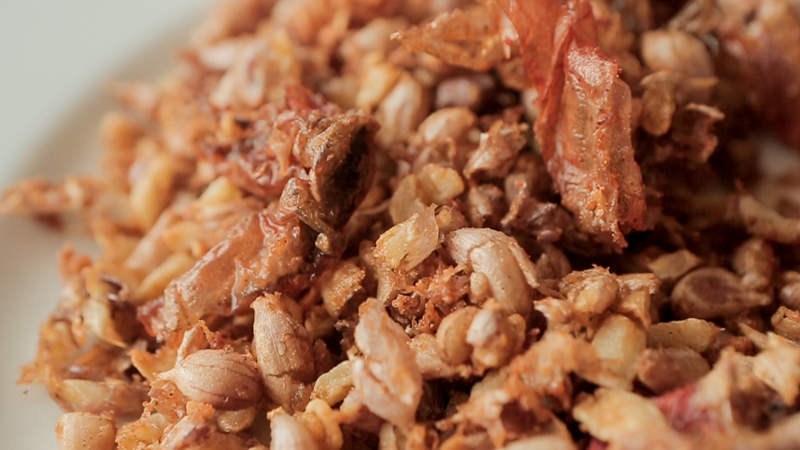 The crunchy garlic bits gave me a mini burst of garlicky essence — strong enough to overpower the flavours of the crab. Last but not least we ordered the Crabmeat And Crab Egg-Thickened Spicy Soup (THB 420++). It came in a hotpot and I could smell the fragrant aromatics such as lemongrass used to season the soup. 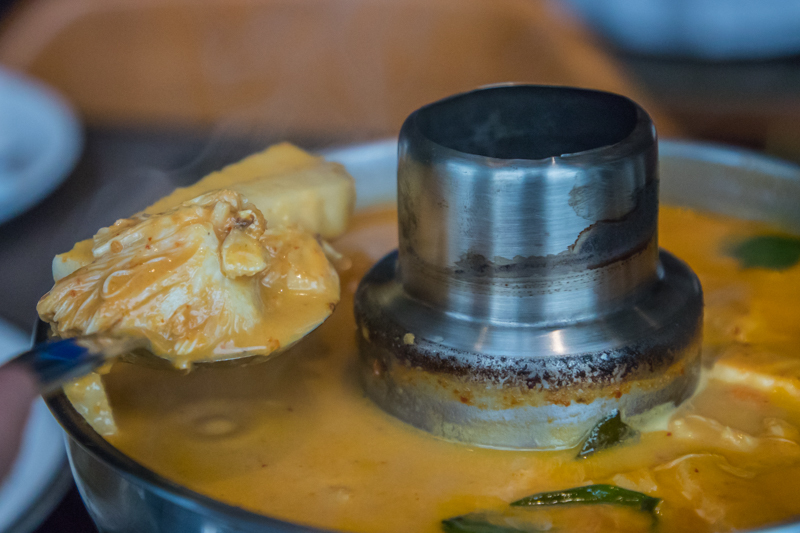 The broth had a thick consistency and I could taste the rich coconut milk flavour that lingered in my mouth. 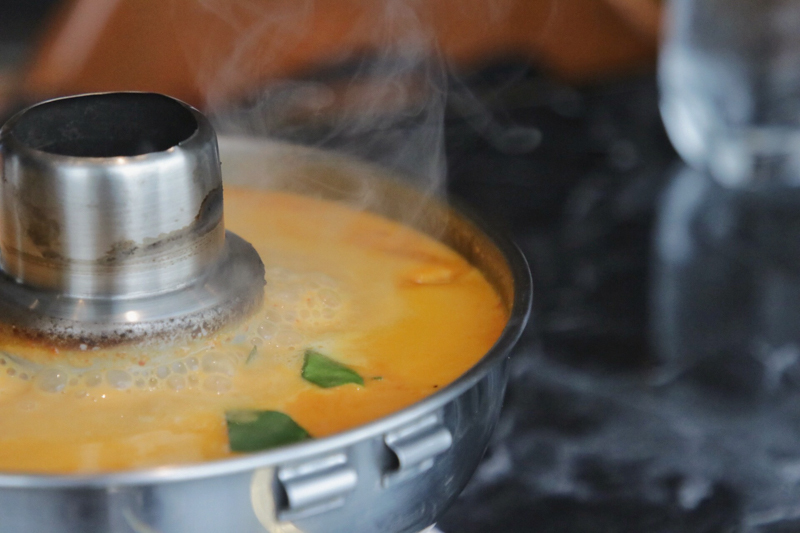 The addition of coconut milk into the soup also helped to cool down the spiciness from the soup. On top of that, the prominent lemongrass in the soup provided a slight citrusy aroma to the soup. Inside the soup, was a very generous serving of crab meat and crab egg. The crab meat was juicy and at the same time very sweet. The thick consistency of the soup and different layers of flavours and aromas made this soup extremely suitable to have it with a bowl of rice. I would draw similarities from the flavours of this soup to a traditional tom yum soup and I really enjoyed this creative twist that Laem Charoen has played on a conventional dish. All in all, Laem Charoen would be my must-go restaurant when I’m in Bangkok. Despite the slightly steep prices of the food, I found that the food was meticulously and thoughtfully prepared. Besides the food, the friendly waiters would greet us when we walked into the restaurant which gave me a warm homely feeling. So, if you crave high-quality fresh seafood with a Thai identity head on down to your nearest outlet now.